3 October 1955 Called Bob Mackin O.N.R. 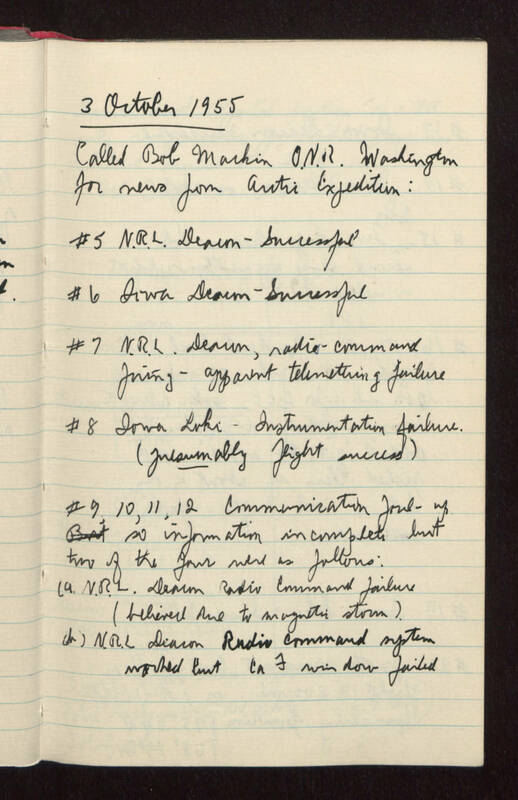 Washington for news from Arctic expedition: #5 N.R.L. Deacon - Successful #6 Iowa Deacon - Successful #7 N.R.L. Deacon, radio-command firing - apparent telemetering failure #8 Iowa Loki - Instrumentation failure (presumably flight success) #9, 10, 11, 12 - Communication foul-up so information incomplete but two of the four were as follows: (a) N.R.L. Deacon Radio Command -- failure (believed due to magnetic storm). (b) N.R.L. Deacon Radio Command system -- worked but CaF window failed.